Considering there's a few users who are into PC tech, particularly on the Video Games thread, I thought it best to start a new thread as we seem to be deviating a little from the topic of conversation on said thread, initially started by Elioterio. If you're a PC user, enthusiast, noob or just curious about the world of personal computers then pop a post on here. Although I'm now on my fourth PC build I'm not 100% tech savvy buy I'll try and answer most questions, as I'm sure other users can put in considerable input as well. If you want to show off your machine or talk about the good old days then please feel free. Makes sense as there is a mac thread. I lost interest in building whopping great towers in the early 00's, it's just intermediate level lego. Didn't think of searching for a Mac thread though I've never been a Mac fan. The first computer I ever used at school was a Mac, apart from the old BBC Micro, what a beast that was! Yeah, my experience with Mac's is that they're always underpowered and expensive. I'm not having a dig as they're still on the market so they appeal to some people, but the OS is locked away and not as versatile. I Like my games too much. Really glad the new CS6 will have a recovery facility as well, the amount of times my graphics drivers have stopped working, but that was down to murdering the RAM. I've popped some tech-talk on the Flickr page. Though I did some modding a few weeks ago adding dust filters to my intake/out-take fans. Man what a difference! I did it on the cheap, it was fun but frustrating, it's trial and error sometimes. I get loads of build up. Did anyone have a look at the Million Dollar PC site? Never seen this before. Incredible stuff. Computers are damn ugly. Those are pretty incredible and some manage to look a fair bit less ugly than most, but still... for the money? What are you running ATM? Recently treated myself to a Dell U2711, which is fantastic. Unfortunately a single 580 won't run BF3 at 2560x1440, but it still looks great at lower res. Ah, I used to build machines. Beasts of machines. 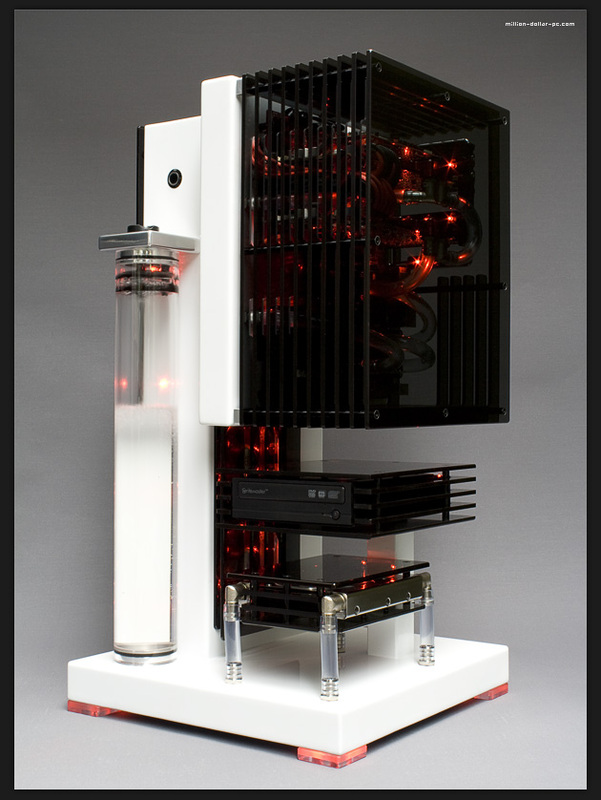 Lovely things, with passive water cooling and various other tricks. My current machine is a HP Z800, which is a workstation in the true sense, comes with a server motherboard with 12 RAM slots per CPU and it takes 2 CPUs. The thing I love about the Z800 is it's diminutive size, that it can take enough of a spec to run many virtual machines, and how silent the thing is so that it doesn't disturb my girl. After 15 years of custom builds I've come around to workstations instead. In my office we all have HP xw8600's. There are some monster work stations in my work, i had to move a dell one the other day that appeared to be made of sold lead. Are you running the forum through the workstation? My friend was talking about running the OS through the RAM which would make the OS almost instantaneous, though costly. That workstation sounds like the bomb. You should get some pictures up. I've not seen a workstation case for a few years, I remember working as a cleaner in town and they were throwing one out, I think, and remember it being a monster of a case. if you can afford an IPS screen get one i've got a dell one, its fantastic you wont regret it. LFGSS is run off 9 virtual machines hosted with Linode. Well I paid about £300 for this but I've had my eye on a couple of monitors that can do portrait (or TATE) mode. I had some shots of my own monitor on its side, dodgy, but can't find them. It's ideal for the internet. Though you really want the sound turned off as the narrator is a moron. Ah right. Are you using the workstation for general daily use? Yeah the guy sounds like a real tool. I hate it when they abbreviate the word "applications" he sounds like a robot reading it from a script in slo-mo for children. Man, is it the American way? I've seen a few tech reviews on Cnet and the like and they all make me cringe. Nah, half-kidding. When all of the linux drives are installed it's a vagrant + virtualbox based host upon which I do testing of server farms. Doesn't test real config of course, or real networks, but works well at simulating how applications talk to each other on networks made of many small application servers. I don't know anything about server farms. What GPU have you got in there? It's old now, not the current series. It's a Quadro FX 4800. Not great for games, but I bought it for the CUDA cores when I wanted to try bitcoin mining on the GPU. Games don't take any advantage of this kind of card so the potential is unused. From the other thread. how hard is it to move my 6 case fans over molex (connected direct to psu) to the mobo so I can control the speeds. 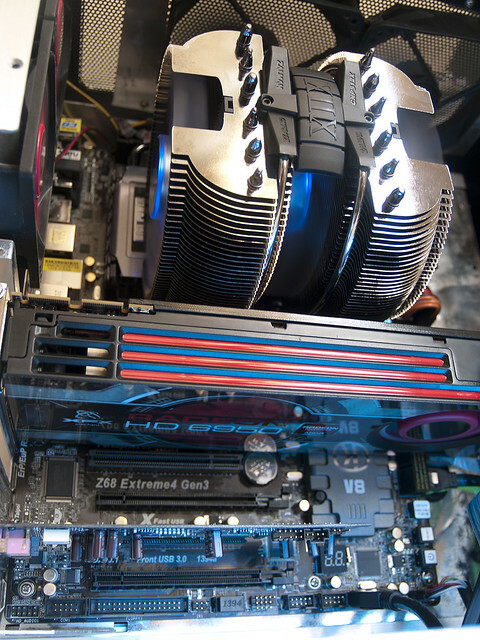 ^ depends what connections you have on the mother board and if the fans will run without molex's, have you got fan control installed somewhere? What motherboard and fans are you running?